Henry Frederick Bond. Courtesy of the Harvard University Archives. 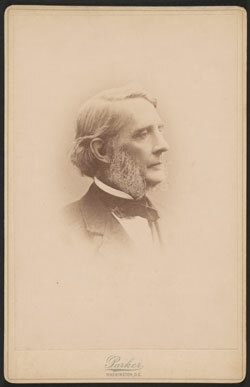 Henry Frederick Bond was born in Boston on May 12, 1820. His father was a prosperous commission merchant. Henry had a healthy social environment, the best academic training and every advantage that an honorable family connection could give him. He graduated at Harvard in 1840 and was long the popular secretary of his class. Then he went on his travels seeking both health and wider acquaintance with other lands and peoples. His voyaging took him as far as India and gave him firsthand acquaintance with people living under very different climatic and cultural conditions. In 1845 he graduated at the Harvard Divinity School. He was ordained at Barre, Massachusetts on January 6, 1846, and served the First Parish for four years. Then followed brief pastorates at Dover, New Hampshire, and Sudbury, Massachusetts, and in 1869 he went as a pioneer minister to Omaha, Nebraska, then still a frontier but fast-growing community. There, besides ministering to the newly organized Unitarian Church, and securing the erection of its first church building, he learned something about the condition and need of the remnants of the Indian tribes still living or wandering in the Missouri Valley and became deeply interested in the problems connected with their adaptation to civilized life. In 1874 he accepted appointment as United States Indian Agent among the Utes at Los Pinos agency in Colorado. He threw himself ardently into the work of improving the condition of his charges, building schools, breaking out farms, constructing irrigation ditches, adjusting quarrels, preaching morality and the simplest forms of Christianity. It was tough pioneer labor without much response or cooperation from a rather sullen band of Indians just emerging from barbarism and without much help or recognition from the Indian Office in Washington. Two years of such labor was all that his always frail body could stand, and he returned to Massachusetts and to quiet pastorates at Northboro and Nantucket. In 1886 his compassion and zeal for the Indians flamed up again. The American Unitarian Association undertook to construct and open a Mission School on the Crow Reservation in Montana and Mr. Bond, then in his sixty-seventh year, eagerly accepted the superintendency. With his devoted wife he went out to Montana, rallied a small company of teachers and carpenters and farmers and, on a hillside overlooking the bleak prairie and not very far from where the disastrous battle of the Big Horn had taken place only a few years before, built a log schoolhouse and some rude dwellings. In a springless wagon and with only an Indian boy as companion, he drove far and wide over the great Reservation making friends with the Indians and enlisting pupils for his school. It was a strange adventure for a man of gentle breeding and delicate constitution but the rugged winters of the comfortless northland could not chill his enthusiasm. He was a born mechanic, and devised, and with his own hands contrived a number of tools and gadgets that made life on the Reservation more endurable. The cream-separator and the hay-tedder he invented came into wide use. The Montana Industrial School filled up with eager pupils and, though in plant and equipment it was very plain and bare, it soon was setting a standard in its teaching and its adaptation to the needs of the people for the Indian schools in other parts of the country. The eastern Unitarians gave it steady and reliable support and the Boston office under the direction of Rev. Alfred Manchester saw to it that everything possible was done to uphold the Superintendent’s hands. All friends of the Indians honored Mr. Bond’s practical ability, sound common sense, and zeal for justice for the original Americans. Finally the Government took over the operation and administration of the School and Mr. Bond retired to spend a genial old age in the comfortable house he bought in West Newton. He died at Bethlehem, New Hampshire, August 22, 1907, in his eighty-eighth year.